The RightBRIDGE Life Insurance and Annuity Validation Tools use an artificial intelligence engine to determine the suitability of a proposed or in-force policy for New York Reg 187. The solution supports new sales, replacements or changes to an existing policy. The RightBRIDGE® Annuity Wizard helps advisors determine which annuities available on their product shelf are best suited to meet their clients’ needs, objectives and preferences. The tool can also be used to validate if a specific product meets a client’s needs and objectives. Supported annuity types include: Variable, Fixed Indexed, Investment Only Variable, SPIA, DIA and Fixed Annuities. Do you want to find a “best fit” annuity for your client? The RightBridge scoring engine pulls in your firm’s annuity product shelf and evaluates it against a set of configurable client questions to determine a set of “best fit” annuities. Is it a Variable Annuity, Fixed Indexed Annuity, Fixed Annuity, Variable Indexed Annuity, SPIA or DIA. Do you need an annuity with a living benefit, death benefit, long-term-care or just as an investment? The RightBRIDGE Annuity Validation Tool uses an AI engine to determine the suitability of a proposed or in-force policies in the state of New York. The solution supports new sales, replacements or changes to an existing policy. Summarizes results in validation report. Do you want to look for an annuity that meets specific criteria: FIA with S&P 500, 2-year term with the highest cap rate? VAs with multiple investment options and maximum investment flexibility. Fixed Annuities with the highest yield to surrender? Do you want to research a particular annuity on your product shelf? Fact sheets on each annuity highlighting such information as: Fees, state approvals, riders available, FIA rates and caps, surrender schedules, funds available and fees. With the large number of annuity products and features available from multiple insurers it can often be challenging for a financial professional to effectively focus on the carriers, products, and features that best meet the objectives and needs of an individual client. The Annuity Wizard helps financial professionals identify the subset of products that best meet the client’s objectives. Not only are the products filtered, but features such as living benefits, death benefits, long term care riders, FIA caps and rates and fixed annuity yield to surrender options are analyzed and presented. • Using an annuity selection process complete with compliance and suitability questions built-in provides Best Interest annuity selection. • Building compliance and suitability rules into the annuity selection process will be key to managing a more regulated sales process and address the Best Interest requirement. • The selection process for annuities has become highly scrutinized and requires an unbiased systematized process complete with the data used for the analysis and an audit trail showing results. Firms will have to demonstrate an auditable process used in selection of annuities and disclose additional information including commissions. The Annuity Wizard functionality has been expanded to address these new requirements. The RightBRIDGE Annuity Wizard begins by gathering key information from clients about their preferences for income, liquidity, time horizon, source of funds (qualified assets) risk tolerance, expenses, and guarantees. The engine then configures and filters the company’s inventory of available annuities and living benefit options and rank orders those that best meet the client’s objectives. The increased focus on acting in the client’s Best Interest highlights the need to provide advisors with tools that analyze available options and empower them to make suggestions that are unbiased and prudent. One page summary provides annuity and rider details, client specific calculations and ReasonText™. ﻿Users can compare an expanded selection of annuity types. The Annuity Wizard can compare an existing annuity to current annuities available. The RightBRIDGE Annuity Wizard gathers a client’s information including preferences and future desires as illustrated in the fact finder. The Annuity Wizard gathers the client’s preferences regarding liquidity, time horizon, risk tolerance, income, withdrawals and need for living benefits. The results of running the RightBRIDGE rules engine is a rank ordered list of annuities from the product shelf that most closely correlate to the client question responses. The RightBRIDGE engine has the flexibility to consider multiple interconnected responses and calculation options for the target income need. The weighted scoring calculations combined with the RightBRIDGE engine simplify complex options, so that they are uniquely configured against the needs and preferences of the client. The ranked annuities are listed on a results page within the RightBRIDGE Annuity Wizard. The engine determines the relevance of specific annuities in the company’s inventory of available annuities based upon the best fit for the client’s needs. The different types of annuities are color-coded in the summary list. An advisor can select any of the annuities listed and is provided with detailed ReasonText™ on each annuity and rider option. ReasonText™ explains the calculations in terms that help the advisor quickly understand and ultimately help the advisor explain the solution to the client. The Annuity Wizard displays detailed Reason Text™ for each product. The comparison page shows a side-by-side view of the annuities selected to compare. 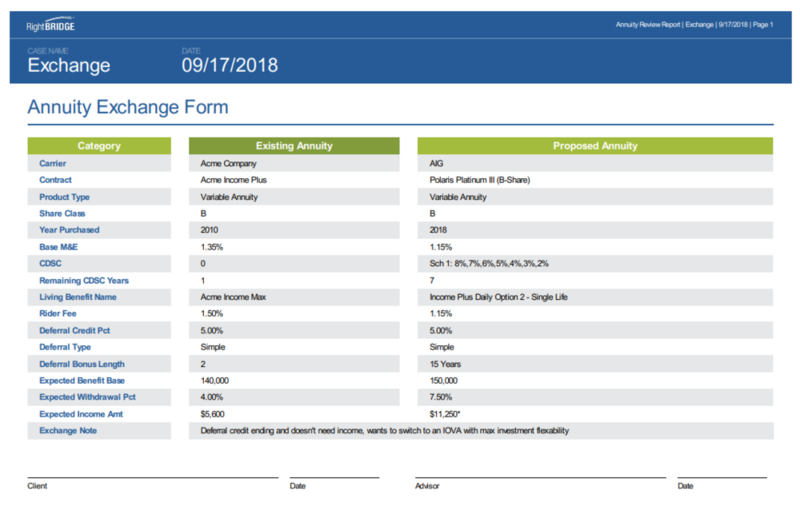 A financial professional can compare the currently available annuities to the existing annuity in a side-by-side comparison as illustrated in the screen to the left. The Annuity Wizard offers an exchange analysis section where the advisor can complete information about the annuity being exchanged, or an optional data feed will pre-populate key information including the product, rider, fees, and surrender period. An “Exchange Analysis” report can then be generated that shows a side-by-side comparison of the current annuity and the proposed replacement annuity. Easily compare the current annuity options to the existing annuity. In addition to the RightBRIDGE Annuity Wizard’s on-screen capabilities a report can also be generated. The report captures the client data used in the analysis as well as selected annuities complete with reason text for each annuity and a comparison chart of the annuities selected. The Annuity Search Tables are designed to find a product that meets specific search criteria. For example, “What’s the highest rate for a 5 year MYGA?” “Which annuity offers the highest cap rate on the S&P 500?” “Who offers the lowest VA fund fees?”. The tables have preset “Advisor Popular” searches but are also configurable by the licensing firm. The search grid can compare various rates, caps and fund fees. Robust client-﻿specific text that﻿ assists an advisor in communicating how a specific annuity and living benefit configuration meets the client’s needs. Side-by-Side Comparisons allow financial professionals to view and analyze selected annuities and sort based on features and costs. ﻿The report captures the client data used in the analysis as well as selected annuities complete with reason text for each annuity and a comparison chart of the annuities selected.